3D Print has recently published this article on a HAB enthusiast who has designed a 3d printed HAB capsule or payload box. Life3D has released a design for a 3D printed capsule capable of carrying a camera as a payload attached to a weather balloon. All of this, of course, assumes that you have access to a weather balloon — which, until I read this article, I had always sort of assumed were the property of governments and evil geniuses, but apparently are quite readily available. The capsule is designed to hold what is known as an ‘action sized’ camera (such as the GoPro) and a GPS device (important if you ever want it back) and still has enough room to be insulated. Once assembled, the capsule is watertight and buoyant so it won’t simply disappear to a muddy depth if it lands on the water. Life3D is a business dedicated to the application of scanning technology to anything that will sit still long enough to be scanned from sculpture to movie stars. Their work is based in Elstree Studios, near London, in the UK and they are the sister company to Lifecast. The designer of the capsule is Life3D’s Director, Tristan Schoonraad, who is based on London and lists his profession as ‘work in the movie industry.’ Schoonraad brings two decades of experience in the film industry in the area of special effects, make-up, and props in a number of high profile films. He has cast and molded everything from humans to monsters and is an acclaimed artist who goes by the name ‘Schoony’ in that persona. The idea of a capsule that you can buy instead of building looks appealing to some. You can download the plans or but it pre made from shapeways for an eye watering 1022$. But the price is not my worry about this capsule. The biggest risk that flying this module poses is safety and the damage that it could do if it becomes detached from the parachute. You do not need high winds ripping it off for this accident to happen. Payloads can become detached simply by human error in attaching it to the main balloon tether. For many enthusiasts, Polystyrene or foam payload boxes offer cheap cost, low weight, insulation and, most importantly, safety if accidents happen and the payload does become detached. 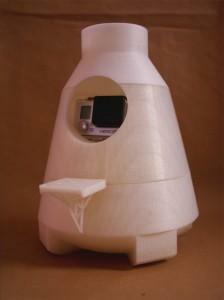 So my challenge to Tristan is to produce a capsule in polystyrene of foam.